Find Out How An Expandable Hose Can Make Your Life Easier! » Find Out How An Expandable Hose Can Make Your Life Easier! Use The Best Expandable Hose Instead Of Your Old Hose! Once spring rolls around, people are putting away their mittens and scarves in favor for shorts, sunglasses, and sunblock! As warm weather draws us out of our homes, there will be plenty of outdoor chores that will need to be taken care of. Before you pull out that old hose from somewhere in the basement or garage, perhaps you should consider using an expandable hose instead. How Is An Expandable Hose Made? Is An Expandable Garden Hose Right For You? Will I Be Using A Sprinkler? Will I Be Using A Nozzle? Before we talk more about the expandable hose, let’s learn more about the garden hose. The first instance of a flexible hose originated well over 2,000 years ago when the ancient Greeks used the intestines of an ox. They removed the intestines and the stomach bladder from the animal and when the stomach full of water was compressed, a stream of water would come out of the intestine, spraying wherever it was pointed. Although the intestine has elastic properties, it didn’t last very long. The hose as we know it didn’t come around until the 1600s when Jan van der Heyden, a Dutch inventor, used leather that was stitched together. Over the next 300 years, the hose has underwent numerous changes in terms of materials used. Some other materials used included canvas, sail cloth, linen, and cotton. All of these materials were extremely heavy when wet, but they also didn’t hold water the best and had a tendency to leak a lot. That all changed in 1870 when rubber began to be used for creating hoses. Later, hoses were made from lighter, man-made materials when synthetic fibers were made. As the name would imply, an expandable hose is a type of garden hose that can expand three times its original length when you turn the water on, but it will also shrink back to its original size when the water has been turned off. This flexibility allows the hose to drain itself for proper storage, but it also doesn’t kink up or become a twisted, tangled mess. Many people who are looking for a new garden hose won’t even give an expandable hose a second thought because they are under the impression that the expandable options aren’t as good as a traditional rubber hose. Let’s take a look at some of the benefits of using the expandable hoses, shall we? Traditional garden hoses can be pretty expensive when you compare them to an expandable garden hose. These hoses are made with cheaper materials, but that doesn’t mean they are subpar. In fact, many expandable hoses will include other items such as a carrying/storage bag, a nozzle, as well as a bracket or a hook to hang the garden hose. Did you know that a traditional rubber hose that is filled with water can weigh at least 50 pounds? If you aren’t careful, you could hurt your back pulling that kind of weight around. By using an expandable hose, you aren’t going to experience those problems because when the hose doesn’t have water in it, it’ll weigh as little as 3 pounds. Also, once you’ve turned the water off from the spigot, the water drains from the hose pretty quickly. Why? Because there isn’t any water pressure to expand the latex inner tube. With the lack of pressure, the water is less likely to stay in the hose, which helps to reduce instances of mold build up. One of the problems homeowners often have with hoses is trying to find space large enough to accommodate 50 to 100 feet of a hard rubber hose. For those homeowners who are short on space may find this incredibly frustrating. However, since an expandable hose contracts to a third of its size and comes with a convenient carrying bag, finding space to store it will be so much simpler. One of the biggest frustrations of yard work with a traditional hose is when the hose gets tangled up on itself and becomes kinked. 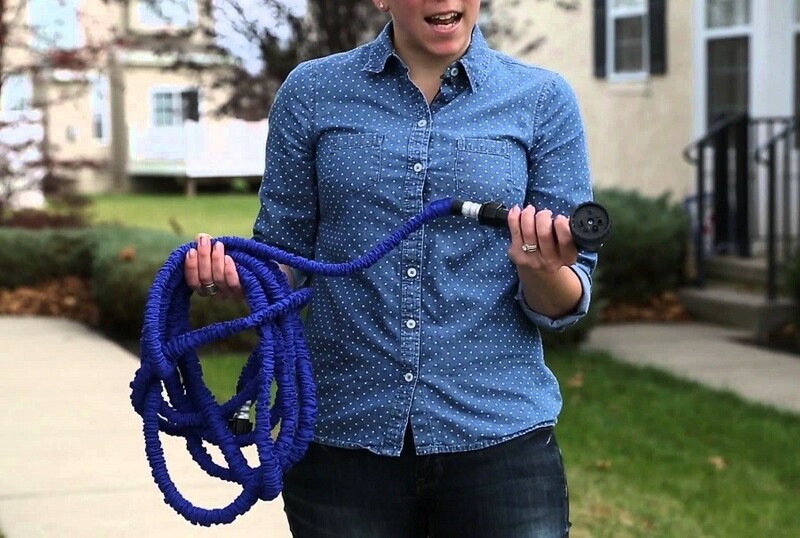 An expandable garden hose is designed to not kink up as much as its all-rubber brethren. This is possible to the flexible latex inner core. We do want to point out that you aren’t going to find a hose that is 100% resistant to tangles. Even though an expandable hose is designed to not get kinks, they still can become tangled on themselves. Therefore, we recommend fully extending the hose before turning it on so that you reduce the chances of the hose tangling as water courses through the hose. Unlike traditional hoses where you have to manipulate the hose to get all the water out of it at the end of the day, an expandable hose will automatically drain itself of any water. These hoses are capable of doing this because there isn’t any water pressure that is forcing the latex to stay open. Once that pressure goes away, the latex contracts and forces the water out. To be able to expand as much as an expandable hose can, there are two layers to the hose. The first, inner layer of the hose is generally made out of latex. The latex will usually have two or three layers to it because a single layer of latex isn’t durable enough to withstand the rigors associated with lawn care. The way manufacturer’s build up this core is by dipping the latex tube in liquefied latex, which will harden and add layers to the initial tube. Now it’s important to note that there are two types of latex that could be used, natural latex or synthetic latex. Natural latex comes from the sap of a rubber tree, but it can also be found in 10% of all flowering plant life, but it’s easier to get the latex from sap. Synthetic latex, however, is created in a laboratory and it is very similar to natural latex in terms of how it performs. Though the two types of latex are very similar, there hasn’t been many studies conducted on the long-term effects associated with prolonged exposure to synthetic. We mentioned that the inner core of the hose will either have a double or triple layer latex core. Many people believe that the triple layer cores are going to be stronger than a double layer, but there isn’t any evidence to support this claim. In truth, a double layer core is just as strong, but they tend to be more flexible than the triple layer. So if you’re looking for an expandable hose that is going to be able to easier to move about the yard, we recommend sticking with a dual layer latex core. Latex isn’t the only type of core you’ll find in expandable hoses. You can also find something called a TCP core, or a thermoplastic copolyester. This type of core is often used in tubes and hoses because it has high heat resistance and it’s more durable than latex, thus extending the life of your garden hose. After the latex hose received the additional layers, next is the nylon cover. The cover is made from nylon because it can easily retract and expand as the hose is being used. The nylon is lightweight so you’ll be able to pull the hose around the yard without getting too tired. Also, nylon is used because it is less likely to become moldy or covered in mildew because the material is capable of drying incredibly easily. Beings as nylon is a man-made material, it will hold up to the elements beautifully, thus ensuring the longevity of your hose. Hoses usually feature one of three types of fittings: aluminum, brass, and plastic. Aluminum fittings are usually found on mid-range hoses. These fittings are chosen because they are going to help keep the hose lightweight. We want to note that the reliability of these fittings depend largely on the manufacturer because less-reputable makers could produce shoddy fittings that are prone to dents and bends when you try to connect it to the spigot or nozzle. A dented or bent fitting isn’t going to allow your hose to connect correctly. Brass fittings are the main type of fitting that you’ll find on the majority of expandable hoses on the market. The brass is resistant to rusting. While brass is known to oxidize over time, that oxidization isn’t going to be harmful to the water that comes through the hose. Like aluminum, the brass is going to be heat resistant, so you can leave the hose connected during the summer and not worry about warping or damage. Plastic fittings have been phased out by the majority of hose makers, but there are still some who use plastic connectors. If you see plastic fittings, you may want to think twice about them, especially if you plan on using the hose a lot. The plastic fittings are usually used to cut manufacturing costs, but they tend to break down very quickly, especially if the plastic is exposed to heat and sunlight. Along with the fittings, an expandable hose will also feature some kind of protective material near the end of the hose. This material will keep the hose from bending right at the point where it connects. There are some cheap hoses on the market that does not feature this component. Hoses that lack the component will have a significantly shorter lifespan because over time, the constant bending will render the hose useless after some time. Hoses are commonly found in three sizes: 25-foot, 50-foot, and 100-foot. With that said, you can also find them as short as 10-feet long and as long as 200-foot. Most homeowners will find the 25-foot and 50-foot lengths are more than enough for their needs. The longer the hose is, the heavier it will be to lug around. However, people with larger hoses may often choose two shorter lengths of hose and combine them with coupler when they have to water plants further from the spigot. By combining two hoses to make one large one, you don’t have to lug around a big and heavy hose when you don’t have to. The beauty of an expandable hose is that the hose isn’t actually that long before you turn the water on. In fact, an expandable hose can expand three times its original length. So let’s say you purchased a 200-foot hose. When you aren’t using the hose, it’ll be a compact down to 65 feet or so. Finding a space to store a 65-foot long hose is going to be much easier than trying to find space for a 200-foot hose! If you’re trying to figure out the length of hose you should get, we recommend getting a hose just a few feet longer than the furthest spot in your yard. This is going to give you the ability to do your chores with the hose, without worrying about snagging on something or even springing a leak. Also, longer hoses aren’t always better. If you have a hose that is too long, you’re going to be stuck dragging a lot of hose behind you. But more importantly, you could experience a change in water pressure. You could have decent water pressure, but if you have a long 100-foot hose, that pressure may not reach the end of the hose. Although it might sound like these hoses are the best thing since sliced bread, it’s important to note that people have reported experiencing some problems when using these hoses. Here are some of the most common issues people have when using them. Storing one of these garden hoses can be blessing and a curse. Sure, these hoses shrink down to a third of their size and they come with a bag, but trying to get these hoses back inside said bag isn’t as easy as you may think. A lot of people think that because the hose is flexible and features a fabric outer layer, it is going to be cheap and not last very long. This is only partially true because the quality and longevity of the hose depends on the manufacturer and the materials used. These hoses have been known to burst after using it for some time. This happens because the water pressure may be too high for the inner core. This is especially true if you’ve purchased a TPC core, as it’s not as strong as a double or triple latex core. In our opinion, the benefits outweigh the drawbacks, especially if you follow the manufacturer’s directions on how to use and maintain your hose. The lifespan of your hose is going to depend on three factors: the quality of materials used to make the hose, the quality of the technology used to make and test the hose and how you use the hose (of you follow the manufacturer’s instructions). While you may not have much control over the technology used to make and test the hose, you can choose hoses that are made from well-known and respected manufacturers, and adhere to the guidelines on how to use and store your hose. When you’re shopping for a new hose, you will want to make sure the outer material is of good quality and has a high denier count, but you also want to check the burst rate. The burst rate means how much water pressure can pass through the hose without the hose bursting. The strength of your hose is going to determine what you can (and cannot) do with it. For example, if you intend on using the hose with a sprinkler or a nozzle, you will want to make sure the hose has a burst pressure of at least 350 psi. If you’re going to attach the hose to a power washer, you will need to read the instructions that come with the power washer first because they usually require a hose with a much higher PSI. If you are going to be using your hose with a sprinkler, we do not recommend getting an expandable hose because there just isn’t enough pressure to keep the hose fully extended. To get the most out of these hoses, we recommend using it with a nozzle because the nozzle is able to keep water pressure in the hose. Expandable garden hoses should be stored indoors in a dark and dry location to make sure all the materials (the latex core, the nylon outer layer, and the fittings) will remain in good condition. Your water pressure is an important thing to consider because these hoses need adequate pressure to function properly. Not only that, but you want to make sure you purchase a hose that can handle the pressure without busting. Expandable garden hoses are one of those things that people are either for or against. Some people think these hoses are a waste of money because they aren’t as durable as a traditional rubber hose. What people don’t realize is that with proper care, these hoses can last just as long as a traditional hose! To find the best expandable garden hose, head over to our buying guide! There, you’ll find five of the top rated expandable garden hoses that are available on the market. We provide you with a brief summary of the features about the product and we also summarize what people had to say about the hose – good and bad. Keeping your lawn and plants alive and healthy doesn’t have to be a chore, especially when you use one of the best rated garden hoses. Leave us a comment below and tell us what you use your hose for the most! We’d love to hear from you!